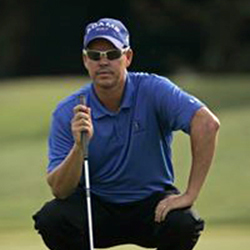 Brad Ott:	Hi, this is Brad Ott, director of instruction here at TPC Craig Ranch Mckinney. Today I want to talk to you about a way to start your warm-up on the putting green. Too many amateur golfers go out to the first two, three, four, five, sometimes nine holes and struggle with speed. I think the main reason that is, a lot of times when amateurs go out to the golf course, they're thinking about making putts. What's the best way to make a putt? You've got to hit your line, right? Everyone talks about reading the putt right and you're going to have to hit your line. You've got to get your club face square. The truth of the matter is, there's very few straight putts on the golf course. Very seldom will you have a straight putt. If you can't control your speed, you will make very few putts that break. Here's a little exercise I want to give you that's going to allow you to have some success in getting off to those first few holes with better speed control that should allow you to make some more putts. All right, this is a, I call it a fringe drill. Every golf course has got one. It's where the green ends, the putting green ends. Some people go right to the fairway. Sometimes you'll see rough off the green. You're looking for the end barrier of the green. In this case the end barrier is right here. We're in the dormant phase right now. February here so it's got a nice contrasting color. You can see where it ends. What I'll do is I'll set up from 10 feet away. This is a 10/20/30 game. You can decide how difficult you want to make it but I think 10 foot's a good start. The next putt will be at 20 foot. You won't be able to see that in the frame so we won't do that. 30 foot will be even further. What you're trying to do is you're trying to putt the ball to the fringe and get it within one footprint of the fringe. Okay? If you want to make this difficult, you can make it one footprint. What I'll do is I'll just come out and mark it and that ball stopped just inside of a footprint of the fringe. That would be a successful putt. If you want to make it two footprints, for some of you amateur golfers, this may be a little bit difficult. You can do two footprints. If you want to make it three, you can do it three. What I'll encourage you to do is, whatever you start off with, as it becomes easier, so let's say you started off with a three footprint training on this fringe drill and you're able to get through 10, 20, and 30 foot putts pretty easily, make it a two foot one the next time. Have two footprints. Once you get to one footprint, that's what I have my high school elite and my collegiate elites and my professionals, they'll have one footprint. They're trying to get three in a row. After you get through the first stage, the 10 footer, move to the 20 foot's phase, and then work to the 30 foot phase. If you can get through all those pretty easily, you're going to have real good control of speed and this should allow you to make more putts. Make sure you add this into your putting warm-up. Don't go straight to the hole. Work on your speed first and then introduce the hole. I think this will help you make more putts.